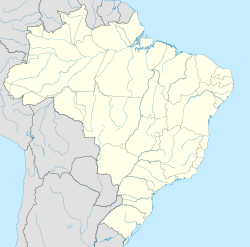 Betim is a city in Minas Gerais, Brazil. It is located at around 19°58′4″S 44°11′52″W﻿ / ﻿19.96778°S 44.19778°W﻿ / -19.96778; -44.19778. The city belongs to the mesoregion Metropolitan of Belo Horizonte (BH) and to the microregion of Belo Horizonte. It is the fifth largest city in Minas Gerais and one of the 50 largest cities in Brazil. Betim is home to a Petrobras's oil refineries, as well as Fiat's largest factory, which opened in 1976. The city has an important role not only in the state's economy, but in the whole country's as well. Jonathas de Jesus, professional footballer. ^ "World Gazetteer". Archived from the original on 2012-12-16. ^ "Morre ex-governador de Minas Gerais Rondon Pacheco". ISTOÉ. 2016-07-04. Retrieved 2016-07-25. This geographical article relating to Minas Gerais is a stub. You can help Wikipedia by expanding it. This page was last edited on 3 April 2019, at 22:04 (UTC).